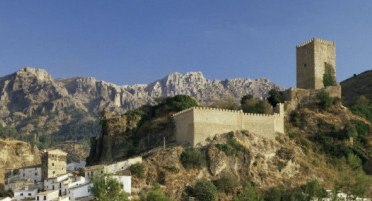 Situated on the western slope of the Sierra de Cazorla is the charming town of Cazorla. The Castle that once protected the town stands majestically on a hilltop overlooking it, and creates quite a dramatic backdrop from the distance. Declared of place of ‘Historic-Artistic interest’ because of the architectural buildings that date back to the Iberian, Roman and Arabian period, Cazorla is also known for its hospitality and has retained many of its local customs. Perhaps the greatest draw for most though, is the fact it is right on the doorstep of one of Andalusia’s finest National Parks, the Sierras de Cazorla Segura y Las Villas. With stunning scenery and wildlife all around you, one place that gives their guests an opportunity to savour it is the Parador Cazorla (Hotel El Adelantado).This typical Andalusian mountain lodge has outstanding views and is set in a very tranquil atmosphere. Sitting out on the terrace, you can see the wildlife, such as deer and wild boar, roaming through the forests. Autumn is always a particularly beautiful time to go as the leaves turn a lovely orange and gold colour. This is also the time of the year when the stags lock horns as they fight for supremacy over their territory. Some of the more interesting sites to visit in Cazorla are the Churches of Carmen and Santa Maria, and the two monasteries, San Juan de la Penitencia and Montesion. Montesion was originally a boys school in 1348, but nowadays it is a hostel for tourists and pilgrims during Santa Semana (or Holy Week) at Easter. Many important cultural events take place throughout the year, such as the International Cycle of Theatre and the Blues International Festival in July. This is also where the Table-Tennis National Championships is held. The first festival of the season is San Blas in February followed by the Feast of San Isidro in May. August celebrates Iruela, and in September they hold their main festival, the Feria de Cazorla. It is always kept very traditional with bullfights, carriages processions, lots of dancing, and excellent local food. Because the nearest airport is 230km away and the nearest train station is 90km, car hire is essential. However, this also gives you the freedom to explore the surrounding area, and a very good place to begin is by visiting the pre-cave paintings in the National Park that date back to 3AD. The spectacular forests and rocky gorges provide a stunning setting for those who wish to take part in country pursuits. There is hunting and fishing, walking and mountain bike trails, as well as some horseback riding. Just outside Cazorla is a waterfall at the spectacular El Chorro Gorge, with incredible cliff edge walks and vultures soaring overhead. Carrying on to the town of La Iruela, are the dramatic ruins of the Knights Templar Castle set high up on a sheer rock face. At one point the road leading to it becomes so narrow you can practically reach out and touch the houses on either side. Beyond the National Park is the pretty hill town of Quesada. You do have to drive to the top of a very windy mountain road, but it is definitely worth the effort, as this is where you will find the Villa Brunel, an excellent example of Roman architecture. The town of Ubeda has a wealth of Renaissance palaces and churches, and the Plaza de Carvajal Square in particular is filled with impressive buildings such as the Palacio de las Cadenas. Each year they hold their immensely popular Music and Dance Festival in May. Basing yourself in Cazorla has many benefits enabling you to enjoy the atmosphere of an ancient town, whilst exploring the stunning National Park and visit the fascinating sites in the surrounding area. Perhaps the greatest challenge will be fitting it all in.